Unlike most other gaming chairs on the market, Respawn's RSP-300 is surprisingly affordable, without sacrificing comfort or build quality. I’ll be honest; in the past, I never gave “gaming chairs” any attention. As a college student, the flashy designs and bold colors seemed like a gimmick, and only served to drive retail prices up the wazoo. 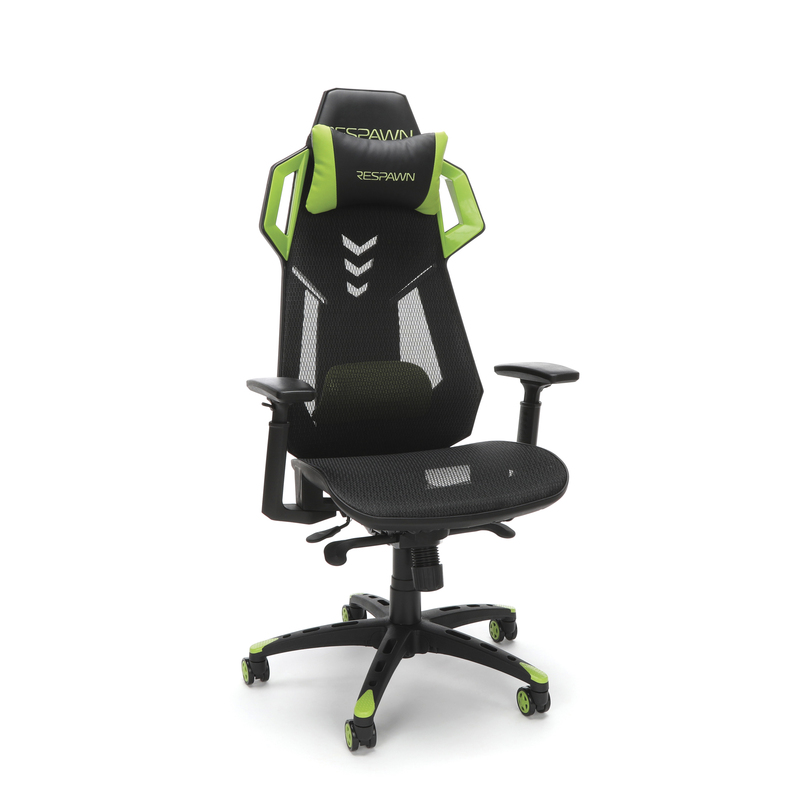 With some gaming chairs coming it at over $500, I tended to stick with more budget, office chairs, considering my “poor college student” status, and most of my colleagues and friends did much the same. Still, I’m not completely set in my ways, and if there’s any proof of that, it’s in my newfound appreciation for Respawn’s RSP-300. Coming it at a reasonable $250, Respawn’s newest product in their line of gaming chairs is comfortable, simple (as opposed to unnecessarily flashy), and most importantly, it won’t break the bank. Of course, the first thing you’ll have to contend with is assembly. Surprisingly, setup is pretty straightforward. Instructions take up only one sheet, with 10 or so pictures that will walk you through the entire process. While one step did confuse me slightly, I had my chair fully assembled in around 30 minutes, a far cry from the afternoons I’ve spent piecing together a few IKEA drawers and desks. While the world of PC gaming has become enamored with RGB lighting and raw horsepower, Respawn’s RSP-300 is not nearly as flashy and ostentatious. The chair comes in five different colors (white, red, green, grey, blue), but regardless of which color you end up getting, the design is fairly simple in nature. Aside from the angled pieces around the base and headrest (which is where most of the color can be found), the RSP-300 is easy on the eyes, and is bound to fit in with the other furniture and decor, regardless of where you end up putting it. One of the biggest differences between the RSP-300 and most other chairs on the market is the backing. Rather than a plushy leather (or rather, pleather) seat, the chair’s seat and back is made entirely out of mesh, a first for Respawn. I was skeptical at first, but after using the chair for over two weeks, I’ve come to appreciate just how comfortable and supportive the mesh material is. It’s also infinitely more breathable; a godsend if you live in a humid area like me, or if you enjoy lengthy gaming sessions. The RSP-300 comes equipped with a laundry list of features, many of which will be standard for those who’ve owned an office chair before. You can recline at an angle of up to 130 degrees, and better yet, you can lock that recline if you’d like to keep your chair at a specific angle. As expected, the seat can swivel in all directions, and armrest height can be adjusted as well, with around six inches or so of maneuverability. While it’s by no means a deal-breaker, the option to move the armrests further apart would have been nice, especially if you’d like some extra space for a long session. All the other basics, including seat height adjustment and reclining tension, are all present. That being said, the RSP-300 comes with a few features which make it stand out from the crowd. After fiddling around with the various levers and knobs, I quickly discovered the ability to adjust the depth of the chair’s seat, which allows you to move the seat closer to or further from the seat back. As someone who falls into the “big-and-tall” category, the ability to adjust seat depth proved useful for sitting comfortably, as opposed to feeling like half my body was being pushed off. Respawn also includes a little headrest pillow, which can be completely removed thanks to its included strap. 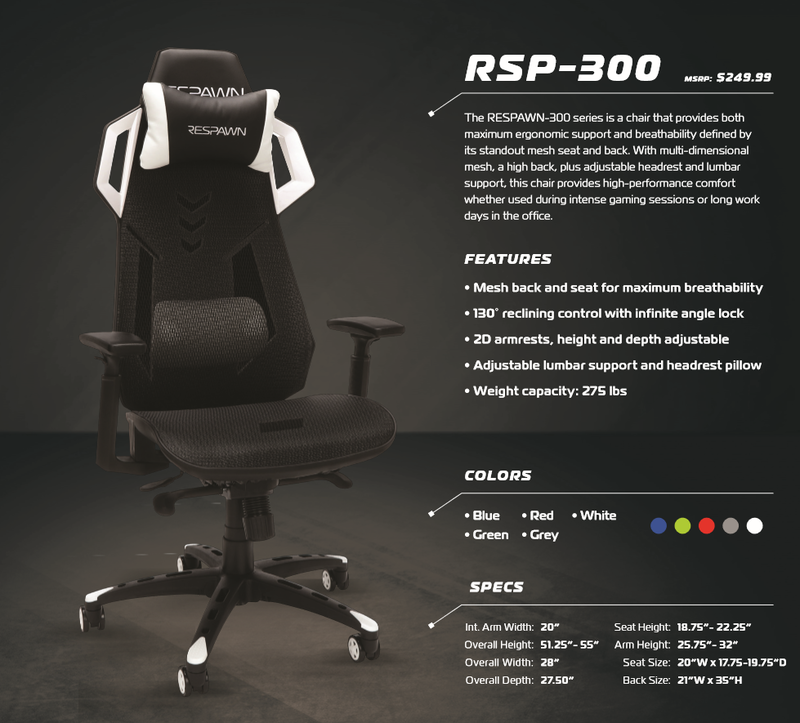 If you’re in the market for a new chair for your office, or even if you’re looking for some seating for your gaming setup, you’d be hard-pressed to find a more versatile option than the RSP-300. While its weight capacity is rather low (coming in at 275 lbs. ), its comfortability and ample features, as well as its shockingly low price point, make it hard to argue against. The RSP-300 Gaming Chair was provided to us for review. Its manufacturer suggested retail price is $249.99, though at the time of writing, it can be found online for around $200.